Overview - Set on May 28, 1976, the last day of school for a group of high school students in a Houston, Texas suburb. 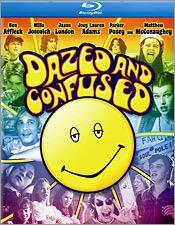 First released on HD DVD in 2006, 'Dazed and Confused' is brought to Blu-ray by Universal on a single BD-50 disc housed in a standard case. Some skippable trailers play upon startup before transitioning to a navigation menu. The movie is provided with a 1080p/AVC MPEG-4 transfer in the 1.85:1 aspect ratio. Though pretty respectable, there are a few minor technical issues here and there. The source print is in good shape and natural grain is visible throughout. Instances of minor edge enhancement, and a faint vertical banding effect in panning motions, are also visible periodically, but don't substantially hurt the presentation. Detail is good, but the picture has a sometimes soft look to it, which appears to be inherent to the cinematography itself. Colors are nice, showing off the fun 1970s palette, but there is rarely any sense of real pop. Black levels are solid and whites are natural without blooming, giving a good sense of contrast. With all that said, the image can look a little dull at times and lacks an impressive sense of depth. 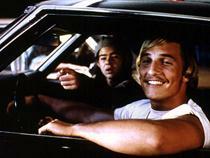 'Dazed and Confused' looks just fine on Blu-ray and Universal seems to have done a decent job. Still, there are a few issues that demonstrate some room for improvement, and I'm curious to see what Criterion has to offer with their own upcoming release of the film. The movie is presented in an English DTS-HD Master Audio 5.1 track, and a French DTS 2.0 track. Subtitle options include English SDH, French, and Spanish. Fueled by one of the best rock soundtracks to ever grace the silver screen, the audio sounds very nice. This isn't a totally enveloping auditory experience, but the modest sound design, great music, and technical proficiency, suit the production well. Universal has included a small collection of supplements including some deleted scenes and a few amusing, but completely unnecessary vintage PSAs. All of the special features are presented in standard definition with DTS 2.0 sound and English, French, and Spanish subtitle options. Deleted Scenes (SD, 14 min) - Ten deleted scenes are included viewable in one chunk with separate chapter breaks. Most of the excised material is pretty disposable, amounting to a few more meandering conversations and some minor bits of plot development which would have served to clearly bridge some events. The real draw here, though, is of course… more Affleck! Though not revelatory, fans will still want to check this out. The Blunt Truth (SD, 4 min) - This appears to be a fake PSA warning viewers about the dangers of Marijuana. Though mildly entertaining, this is pretty superfluous. Retro Public Service Announcements (SD, 2 min) - Two vintage PSAs are available to view separately or together. The first one deals with the dangers of spreading VD, as told through the magic of cheery song, and the second is the oft-parodied environmental awareness ad featuring a crying Native American. Though amusing enough, these little additions have nothing to with the movie. 'Dazed and Confused' is a funny and heartfelt look at adolescent culture through a loose lens of organic storytelling that's free of the rigid constructs of traditional plotting. The video transfer is solid and the audio is very good. Supplements are sparse and only vaguely related to the film. Universal has done a decent job with this disc, but most potential buyers will probably want to hold out for Criterion's upcoming release, which at the very least will provide more substantial special features.